Capital Connection Cocktails builds on the highly popular Monday night by expanding the wine table hosting and opening it up to all professionals. 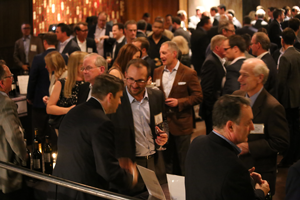 Feature your firm at this classic event: All Investor / Lender firms with a reserved table can host a wine/beer/drink tasting table at no extra registration fee. There is no additional cost except the drinks you wish to provide. Previous hosts have typically brought a case or two of wine. This is where you'll connect with the rest of the deal community, get leads from key advisors and continue to build your brand and network. as an Investor or Lender.